When your mother wants to go to the store, how does she get there? She may walk, but most of the time she drives. There are many car parts that make the car work, but one of the most important parts is the wheel. Most cars have four wheels. If one of them goes flat, the car is difficult or impossible to drive, and it will not take you where you want to go. Of all the inventions humans have designed, the wheel is one of the most important and most simple to understand. Evidence from archaeology shows that wheels go back thousands of years. But did you know that humans did not really invent the wheel? What I mean by that is God invented creatures during the Creation week that roll almost exactly like wheels. Scientists have been studying these animals and trying to learn how to make robots that can roll like the animals do. 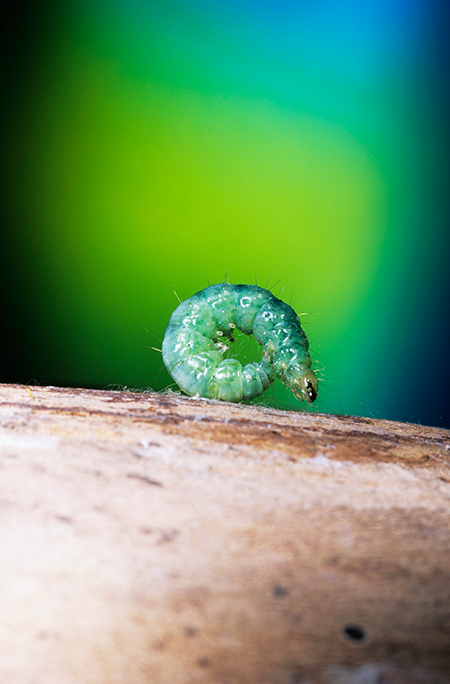 One of the most famous rolling creatures is the mother-of-pearl caterpillar. This little green critter does not look like anything extra special. It pokes along at the normal caterpillar pace most of the time. If it is threatened, however, it has an amazing ability to roll away from danger. It anchors its back end to the ground and pulls its body up with lightening speed. Then it curls into a round wheel shape and launches itself backwards. By doing this, it can travel 40 times faster than it normally travels. That means it can go about 15 inches in one second. For a caterpillar, that is super fast. The Mount Lyell Salamander is another creature that really knows how to rock and roll. It spends time on the sides of hills or slopes. If it wants to go down the hill quickly, it can roll its body into a tire shape and bounce down. The way it rolls its body up allows it to be very flexible and absorb the bumps and shocks of the trip. 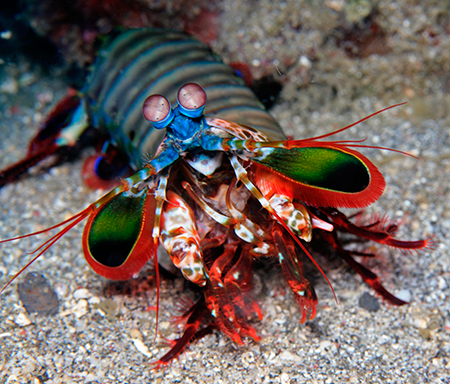 Another animal that has the ability to roll is the mantis shrimp. It normally swims, but some species end up “stuck” on the sandy beach. 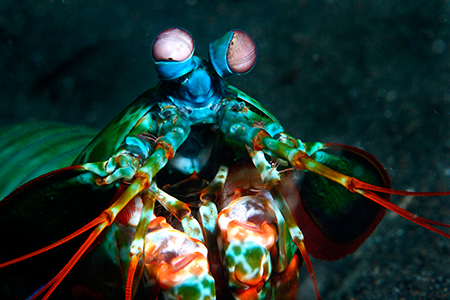 In order to get back to the ocean, the shrimp can roll into a ball and somersault toward the water. 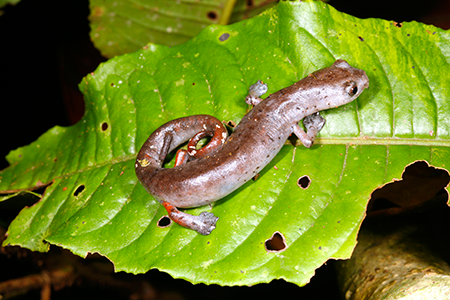 This is a salamander but not a Mount Lyell Salamander. Scientists at Tufts University realize what an incredible ability these creatures have to roll so quickly. These researchers have spent thousands of hours designing a robot they call the GoQBot. The scientists have tried to copy the body design and ability of the mother-of-pearl caterpillar. These engineers have done a great job creating a machine that they believe will be useful to man. Even though this robot is impressive, it is not as good or as quick at rolling as the mother-of-pearl caterpillar. 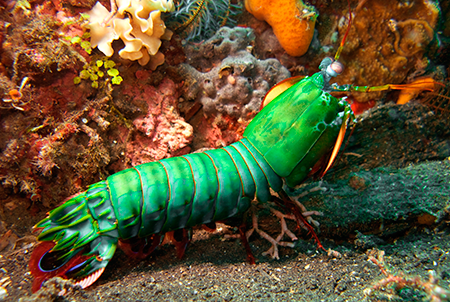 When we think about animals with amazing abilities to move, such as the mantis shrimp, rolling salamander, and mother-of-pearl caterpillar, we can see that they have been designed by an intelligent Mind. A series of chance processes of evolution working over millions of years could not have caused their remarkable skills. Instead, we see that an all-powerful, all-knowing God is behind their ingenious design. Isn’t it amazing how many different animals with interesting abilities God put in the world for us to study? We should always remember to thank Him for such variety.